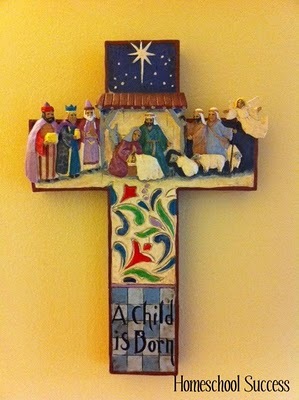 I love this Jim Shore cross that hangs on my wall during Advent. It was given to me by one of my sweet piano students. When I look at it I feel peaceful and I remember what this time of Advent should really be about. Each day I'm trying to be intentional about Advent, and the biggest thing that has helped me is having an "Advent Buddy". My friend Lynn sends me emails about remaining peaceful during Advent, and we talk about how we're trying to combat the "busy"ness of the season. This afternoon I'm lighting a candle, taking a bath, and just relaxing for a little while. Yes, there is laundry to fold, cookies to bake, and lots of other things that are pulling on me. There is nothing more important, however, than reflecting upon the gift of Christ's birth. I'm hoping this peacefulness will spill over into our home and also into our schooling. In many ways it already has, and for that I am thankful. What do YOU do to remain peaceful and intentional during Advent?